Antonio Gaudi’s church of Sagrada Familia – fully known as the Basilica and Expiatory Church of the Holy Family – is the most popular attraction in Barcelona. Roughly 3,000,000 people a year visit the church, which is sometimes erroneously referred to as a cathedral. (The church is not where Barcelona’s bishop has his ‘cathedra’ or Bishop’s chair.) When it is completed the central tower, one of eighteen spires, will rise above the crossing about 550 feet or 170 meters, making it the tallest church in the world. Rooted in the great cathedral tradition, Sagrada Familia is characterized by dizzying structural innovation and formal, ornamental, and symbolic exuberance. It is by turns fantastic, playful, severe, and cerebral. The church is widely judged to be the vision of a genius, but has generated substantial controversy and criticism from both aesthetic and political perspectives. Aesthetically many find the building to be excessive, and some find it incoherent. Its parts don't seem to share a common language. Politically the church has been seen as an expression of Catalonian separatism or of an authoritarian Catholicism that figured prominently in 19th and 20th century Spanish politics. In 1936, 10 years after Gaudi's death and at the beginning of the civil war, a few Republican revolutionaries broke into his studio at the church site and destroyed models and drawings. This made all future interpretations of Gaudi’s intentions open to dispute, due to incomplete information. 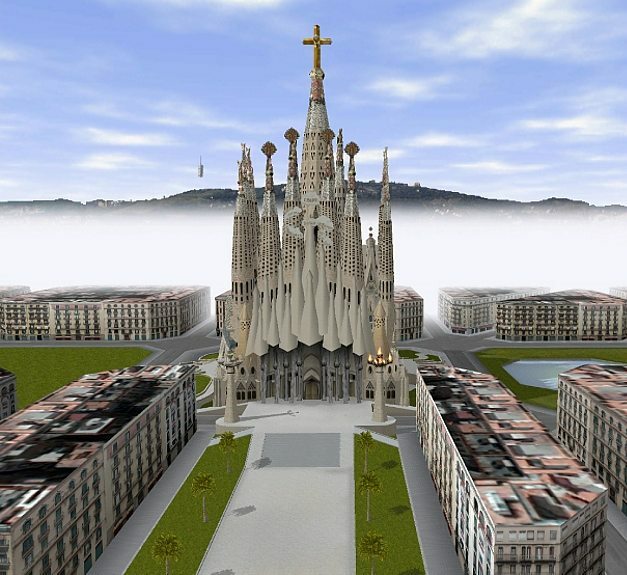 Sagrada Familia was begun in 1882, as the private endeavor of a publisher who wanted to honor the Holy Family. Within a year the initial architect quit and the 31-year old Gaudi became responsible for its design and construction. While he built on its Gothic plan, the church he designed over the next 40 years defies easy stylistic categorization. Sagrada Familia was the culmination of a sparkling career of impressive commissions, and several of his buildings are now listed as world heritage sites. Around the time Gaudi became the chief architect for Sagrada Familia, he began reading the Bible and attending mass daily. He had had a spiritual awakening which was initiated by his friendship with the Bishop of Astorga. Perhaps a serious illness of 1911deepened his spiritual focus, because after 1914 he took no other work and devoted himself to the construction of the church. At the time of his death in 1926 he was living an impoverished existence on its site, wearing clothing that was sometimes literally pinned together. He would occasionally publicly beg to raise funds for it. At his death the church was about 25% complete, with the Crypt, the Apse, and the majority of the Nativity Facade completed. Building was fitful to the 1960’s, but picked up in the last four decades of the 20th century. Today construction is constant, funded by entrance fees and donations. The hope is that the entire church will be complete by 2026, the 100th anniversary of Gaudi's death. 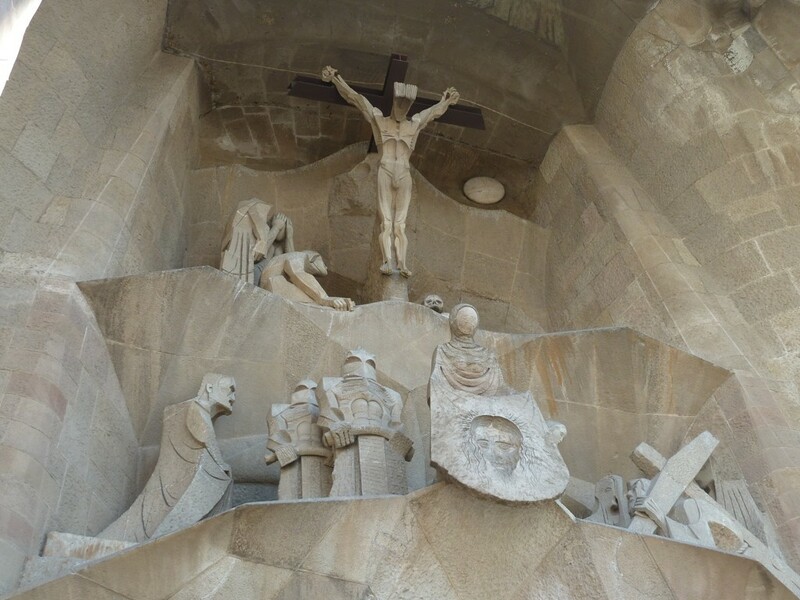 Sagrada Familia is a visual encyclopedia of Christian narrative and Catholic doctrine as Gaudi sought to embody the faith through images, symbols, and expressive forms. He was inventive as well as traditional in his treatment of iconography and Christian conventions. Thus the oversized snails used for some gargoyles were not fantastic creatures, but were carved from casts of small snails found at the site. The two central columns of the first facade to be constructed, the Nativity Facade, rest on tortoises, evidently adapted from Chinese symbols of stability and permanence. 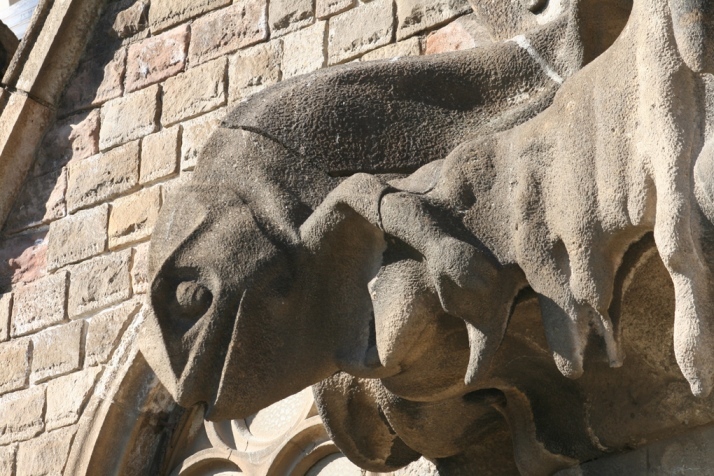 But two large chameleons roaming at the sides of the facade suggest mutability and change. In the nearby Rosary Chapel, sculptural representations of the temptations have stimulated visitors’ comments. People often mention the representation of violence, where a serpent with a fiendish head hands a man an Orsini bomb, the type used by anarchists to bomb the Barcelona opera house in 1893. 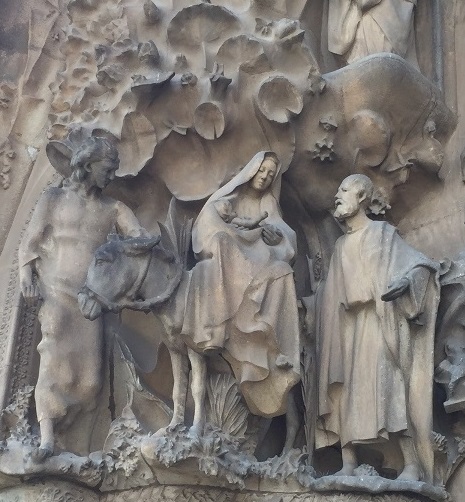 Surely the Nativity Facade itself, with its deep arches, superabundance of garlands, vegetation, and descending wavelets of stone is unique in church imagery. It effectively dissolves the perception of structural support into an overwhelming, undulating flood of symbol and decorative detail. Amidst this cornucopia of fertility the narratives surrounding Christ's birth are related in sculptural tableaux with multiple figures – some of which Gaudi personally worked on. The forms are naturalistic and often references living models. A young draughtsman working on church plans posed for the trumpeting angels on the facade, and the donkey seen in The Flight into Egypt tableaux was carefully chosen by Gaudi, and cast from life as a model for the stone carvers. Walking from the Nativity Facade around to the Passion Facade can be a dislocating experience. Construction on this facade, based on one sketch Gaudi made when he was ill in 1911, began in the 1950’s. Gaudi had thought about starting the church by building the Passion Facade first, but believed its stark expressive nature might alienate people. He said he wanted the facade to ‘... give the idea that sacrifice is a bloody business.’ The 18 bone-like forms above the angled porch roof were meant to suggest the rib cage of someone suffocating by crucifixion. But for many, the spare, expressionist language of the facade seemed antithetical to Gaudi’s existing work, and a manifesto was circulated in the architectural community demanding that construction stop. The signatories included the architects Le Corbusier, Mies van der Rohe, and Walter Gropius. The final facade, the Glory Facade, is under construction now. It is the largest, and will be the main entrance to the church, with a total of seven doors. It too will have its own singular language. Models depict a kind of suspended canopy of inter-linked and inverted cones above the doors. According to literature sold at the church, these may be seen as clouds and as tears. Tears are appropriate for a church that is a temple for atonement. Above this canopy are spires and four taller towers representing the four evangelists. Evidently Gaudi intended this entrance to symbolize the last things, Death, Judgement, the Descent into Hell, and finally Glory. The ascending clusters of Sagrada Familia’s distinctive towers create a singular profile against Barcelona’s skyline. Yet a close experience of the church, as one walks its accessible perimeter, is not singular. Words, texts, symbols, images, varieties of materials, stylistic pluralism and formal fragmentation all vie for attention, and create a dissonance reminiscent of post modernism. While the church is not finished, I suspect that sense of dissonance will remain. Of course, stylistic changes during a building’s construction are not unique. A famous example is Chartres, where almost 400 years separates the building of the two different towers framing the western entrance. Many churches of old attracted crowds of people too and fulfilled social functions beyond personal devotion or corporate worship. What is unique about Sagrada Familia is that its construction coincides with the decline of Christendom and perhaps unwittingly indicates that. Institutionally the church is rooted in Christendom, but its material form emerged during a period of increasing public skepticism about religion. 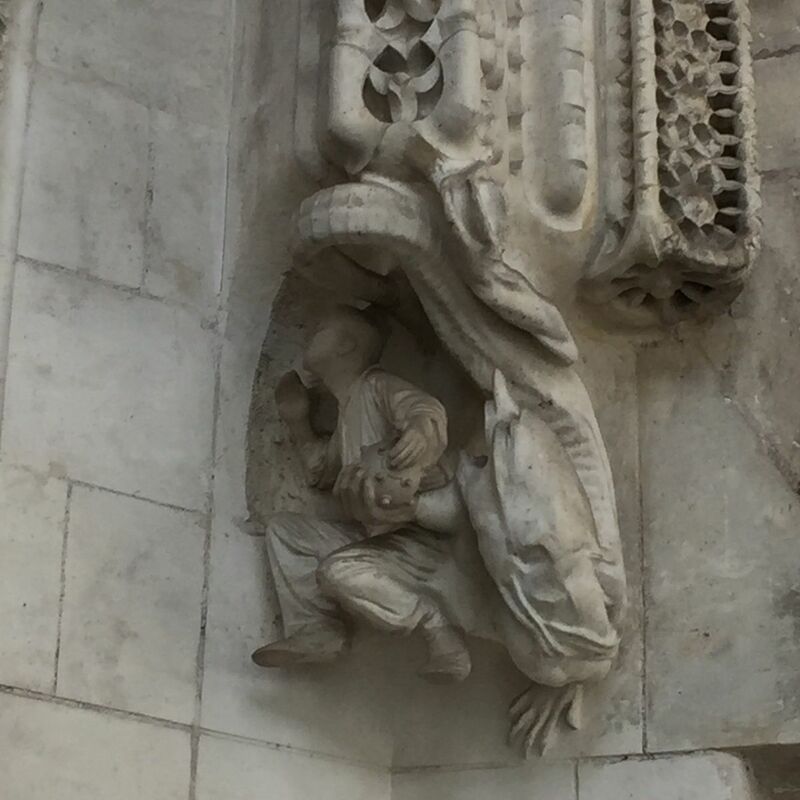 Thus Sagrada Familia’s ‘religious dimensions’ may falter when they are pitted against the artistic judgements of the public, who appear to have more concerns about the church’s aesthetics than about its religious beliefs. 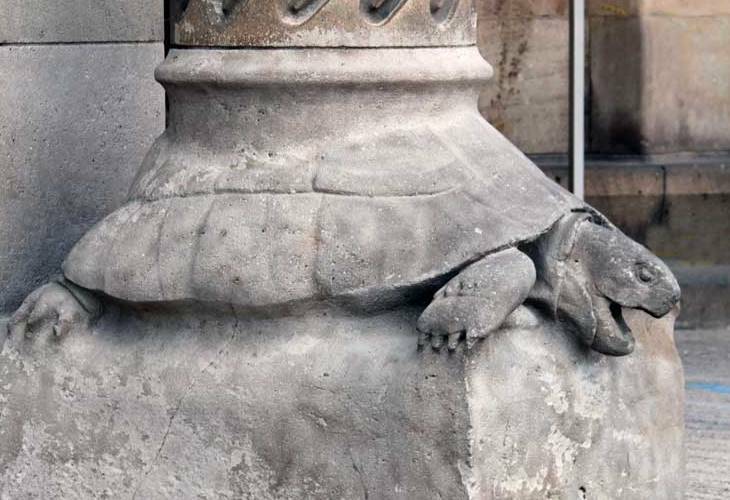 How prescient then of Gaudi to put those turtles and chameleons at the Nativity entrance. They frame our experience. While the chameleons are more easily noticed, it is the less visible turtles that support the whole edifice. And we have to look harder now to find the ‘the permanent things’ the Christian faith proclaims exist beneath all our cultural flux. But apparently Gaudi was not too worried about change. He was quite clear that the church would be modified by his successors, as he was just one servant in a line of servants, all working for a Client who ‘is not in a hurry’. Hopefully many of those 3,000,000 yearly visitors will see this as they try to take everything in. Theodore Prescott is a sculptor and writer who lives near Harrisburg PA. He has exhibited in the United States and Europe, completed several public commissions, and has work in public and private collections. In 1980 Prescott began the art major at Messiah College in Grantham, PA. He chaired the art program for a decade, and was the recipient of two successive terms as a Distinguished Professor of Art. He is an Emeritus Professor of Art at the college. Prescott was one of the founders of the American organization CIVA (Christians in the Visual Arts), served as its third president, and edited its triennial publication for more than a decade. His articles on art have appeared in several publications, including American Arts Quarterly, Image, and The New Criterion. He has edited one book on contemporary figurative art and written several catalog essays for group and solo exhibitions by contemporary artists. His work and a list of publications can be seen at www.tedprescottsculpture.com.